My nails are some kind of sick joke. They're the weakest, brittlest most flakey excuse for fingernails that ever existed. And because of that, I might as well just retire from the nail polish game forever - as no matter how neatly I paint them; they're going to chip the next day. Standard. SensatioNail very kindly sent me one of their Express Gel [Made Him Blush] Starter Kits* [rrp £34.99] to try out, which I was hoping would be the answer to all my prayers. My nails cope with life much better with gel or Shellac on - I'd just never really considered getting a lamp and the equipment to do it myself before. The kit comes with full instructions, a nail polish, cute LED lamp, nail file, cuticle stick, a USB power cable and a European plug head - but even though I'm totes British, this isn't an issue - I just use the USB cable plugged into my iPhone plug head or power it through my laptop. And I have some of those plug adaptors knocking around somewhere too. SensatioNail's one step gel nail kit has everything you need to start doing your own beautiful gel manicures from home [or wherever life takes you!] The shade of Express Gel Nail Polish included in the Starter Kit is a stunning, pale pastel pink shade named 'Made Him Blush' which is the ideal colour for Spring and will really complement your tan in Summer. The LED lamp is dinky, portable and super cute - I've really, really enjoyed trialling the kit out, as using it has made me feel like a proper professional adult; like I've got my life in gear! The fact it charges via USB gives you the freedom to paint your nails on the go too, wherever you are. The SensatioNail Express Gel Polish itself is the latest innovation in gel manicure technology - a simple, one-step user, home [but with professional quality results] gel system. Using it is super easy - simply prep your nails, apply your first coat of polish, pop under the lamp for 30 seconds, apply your second coat, stick under the lamp for an additional 30 seconds and boom - you've got yourself a manicure. You don't need topcoat or basecoats to rock the results; making the whole process smooth sailing - as well as quick! The Express Gel Nail Polish dries in just 60 seconds and lasts for up to two weeks. That my friends, is the dream right there. 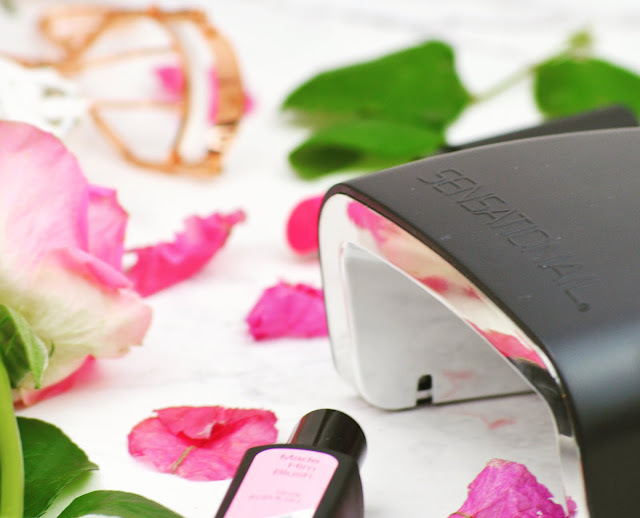 Once you've invested in the starter kit, SensatioNail sell individual nail polishes you can use with the LED Lamp too; giving you tonnes of flexibility and the ability to match your talons to any outfit. There's so many to choose from!! - Apply thin, even coats; to avoid bubbles. So, aside from feeling like a pure nail techn and never getting over the novelty of owning my own LED Lamp, how did I find my SensatioNail experience? Bloody brilliant, to sum it up. The gel polish was gentle to my crappy nails and remained in place for much longer than any other home polish I've used. EVER. The manicure didn't quite last the 10-14 day average for me, as my nails are really bad [I'm not just being overdramatic lol they're legit a joke!] but on someone with less feeble fingernails, you'd be golden. I think I managed about a week, which is a minor miracle for me and SEVEN TIMES better than I'd usually manage. And the quick drying time & no risk of smudges is an absolute life changer, especially for someone with a lifestyle as manic as mine! To find out more, head to SensatioNail's website; or check their socials [here, here and here] - I know I'm certainly feeling very tempted to invest in a few more shades for Summer right now! Have you tried an at home gel nail kit before? Which SensatioNail Express Gel shade would you go for? *This post contains items I was gifted for the purpose of review, but as always, all opinions and sweary language is 100% my own.